Aug 17 Call Redialed: NEW Katie Thompson Interview: "R.R.R.E.D. A Secret Musical"
Katie Thompson is a force to be reckoned with! She has one of the most powerful/dynamic voices I have ever heard. Her music/lyrics is the right mix of profoundness and fun. Katie's show, R.R.R.E.D. A Secret Musical, written with Adam Jackman & Patrick Livingston, and directed by Andy Sandberg, is one of the most fun evenings I've had at the theatre! The show is about a secret redheaded revolutionary organization who is taking matters into their own hands, fighting back against their imminent extinction and standing up for the rights of redheads everywhere. This show is 90 minutes of pure fun! Katie & I had a great time talking about this show, the music, and why red heads have more fun! R.R.R.E.D. 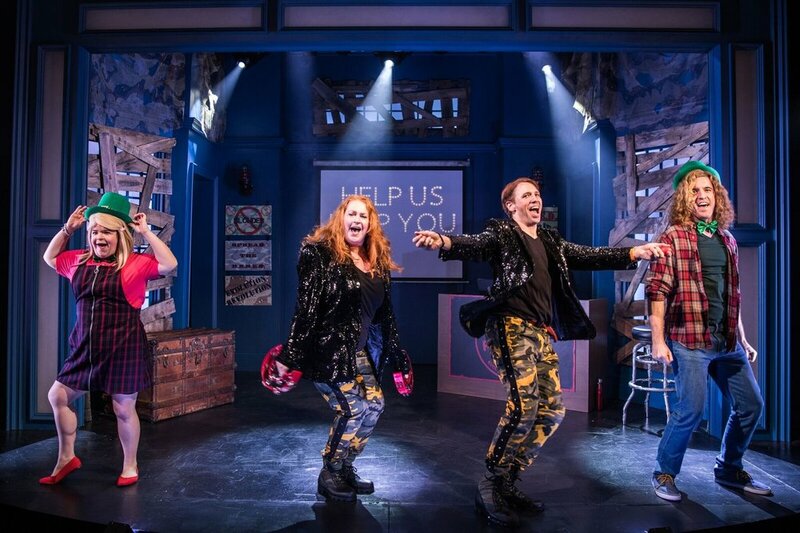 A Secret Musical plays at DR2 in NYC's famed Union Square (103 East 15th Street). Click here for tickets and follow the show at http://www.rrredthemusical.com, Facebook, Twitter, and Instagram! For more on Katie visit http://www.katiethompson.com and follow her on Facebook, Twitter, YouTube, and Instagram! 1. Your musical, R.R.R.E.D. A Secret Musical is currently playing at DR2. I first saw this show in NYMF 2009. What is it like, after nine years, to finally have this show premiere Off-Broadway? It’s amazing! I really did not plan for it to debut anywhere-let alone at the DR2 almost 10 years later. 2. What do you feel has been the biggest change to this show since the NYMF run in 2009? It’s back to being a one-act! Which I love. And replacing the mid-show group number with “Dead Before We Know It” was a huge shift – but better I think. 3. What was the hardest part about writing on this show/music? Actually the hardest part was re-writing without my collaborators in the room with me (Adam Jackman & Patrick Livingston). I mean, we’d email and work on any huge changes, but for the most part we’d talk once a week-ish – and I hate staring at a computer for too long. The same goes for the music. I write it, write it down in my weird coded way, then play it. Using notation software - although I know how - is like putting me in jail…just ask our MD, Rodney. 4. The show's description reads "A secret redheaded revolutionary organization is taking matters into their own hands, fighting back against their imminent extinction and standing up for the rights of redheads everywhere." Given the current political climate we are living in, it's almost too perfect of a time for this show to be on the boards. How do you feel this show can help us during this difficult time? Honestly, the first time I performed “Silence is Red” in rehearsal – I got a little choked up. I had no idea a song where "Victoria" describes waking up in a storage unit with her head shaved, would live in a “real” place politically. But it does. Now is the time to NOT BE SILENT. Silence is not golden. It’s definitely red. 5. The cast you have assembled for this show is unreal: First of all there is YOU, Matt Loehr, Marissa Rosen, and Kevin Zak. Did you know this was the cast you wanted when you knew you were going to have your Off-Broadway debut or was just chance through auditions that you felt these actors were the right fit to tell this story? Marissa was definitely a no-brainer. In fact I didn’t text her until I KNEW she accepted the role, ‘cause I didn’t want to put any pressure on her as a…fellow actor who knows what it means to take an off-broadway job. But I was ELATED when she accepted. And we found Kevin at an actual audition. He was hilarious, and perfect for "Craig!" I later learned he was also a fellow comedy writer when I attended a reading of his Bloody, Bloody, Jessica Fletcher and nearly peed my pants laughing. He is a gift! 6. Every week you have a different guest star in the show. What are the challenges in having this constant rotation and what makes it exciting? Well…all the testimonials used to be rotating - so having only one seems easier! I have ABSOLUTELY ENJOYED having amazing actors sing “Redheaded Stepchild” in their own specific way…honestly, I am so lucky. 7. What are one or two fun stories you can share with us from either rehearsal or these first few weeks of previews? Well, learning how to cover – if and when Marissa or Kevin – or Matt crack me up onstage has been challenging. That, and performing for people who come into the show not knowing ANYTHING about what they’re about to see, and hearing how much they laughed, and loved it is amazing…just middle America popping into see our show. Awesome. Also – on a completely personal note: Writing both Heterosexual and Gay versions of “Redheaded Stepchild;” including everyone was really cool – and seeing it effect people…that’s the stuff. 9. Why, in your opinion, are redheads more fun? Of course we are. Next question. Katie Thompson has been seen as "Rhetta Cup" in New York City Center's Pump Boys & Dinettes, "The Witch" in the Oriental Theatre's Big Fish in Chicago, and "Vashti Hake" in Giant at The Public Theater. In addition to her work as an actress, Katie's original music has been featured on So You Think You Can Dance (America, Canada, and the U.K.). Katie has been a featured composer in Playbill's Contemporary Musical Theater Songwriter's You Should Know, and It's Revving Up –The Next Generation of Female Songwriters, and her work has been featured in Lincoln Center's New Contemporary Songbook series. Original solo albums: Private Page, KT LIVE, and What I've Done Right. Her favorite experiences include playing cards in the green room at The Public Theater, and singing for First Lady Michelle Obama. Aug 20 Facetime Interview: "Stephanie Hicks and Her Selfie Stick" (a.k.a. Marissa Rosen): "R.R.R.E.D. A Secret Musical"